Online Rummy Games | How to Play Rummy 500? Online Rummy Games : How to Play Rummy 500? 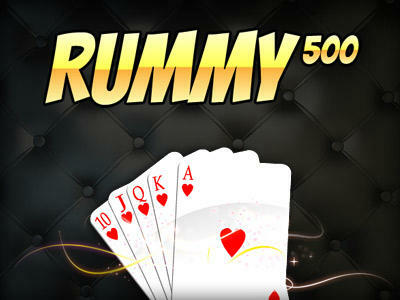 Rummy 500 is an excellent card game to enjoy with family and friends. Listed here are certain techniques by which you can enhance your game and turn out to be a better gamer. Many people are reluctant to pick up the pile of cards in a game of rummy simply because they understand that there is a possibility their challenger will be dropping out soon leaving them with a ton of cards in their hand. Picking up a pile of card in a rummy 500 game can actually benefit you by not just letting you to make some quick points, but it also provides you the potential to avail more points in the future. It is very improbable that your competition in rummy will drop out just after you draw the card unless they have 1 card in their hand and just get a highly fortunate draw. In rummy 500, if I have a pair in my hand I like to dispose of 1 of those cards. It aids me in a plethora of possibilities, first if I put down a Queen it tells my opponent that I do have another Queen, so they might discard one too, thinking it is safe. It also gives me some free rummy cards in my hand so I do not have to keep both Queens in my hand waiting to get a 3rd one. Remember if you get a 3rd card you can always pick up the discard pile to play them. Try to control your opponent’s moves in any variation of rummy. For example, if all you have in your hand is 2 Aces and you know your opponent has 2 Aces along with other cards don’t keep staling and hoping they discard an Ace so you can go out. Instead discard an Ace so they can play it. This way you play your Ace off of their lay down and go out first.